Rethinking Faith and Church: Tithing: Is It Christian? Certainly it’s still preached from many a pulpit, resulting in many people being “guilted” into tithing, but the question is, “is tithing Christian?” Is there any support in the New Testament for the practice of tithing? What is the New Testament example of giving? Why is tithing still taught in Christian circles? First of all it is important to note that there is no New Testament teaching in support of “tithing.” Yes, Hebrews tells us that Abraham gave a tenth to Melchizedek (Hebrews 7: 1-10), but that certainly is not a teaching in support of tithing. What Abraham gave was a voluntary gift, not sanctioned by the Law, for the Law of Moses had not yet been given. Besides, though Abraham tithed once, there is nothing in the Scriptures that suggests that he ever did so again. It is likely that “tithing” for Abraham was only a one-time event. Tithing is an Old Testament concept (Law). It ranks in the same category as the other Old Testament Laws, such as circumcision, keeping the Sabbath, eating pork and a host of others. The truth of the matter is, we either teach and practice ALL the Laws, or NONE of the Laws. To use the above examples, if we’re going to teach and practice “tithing,” then we had better also teach and practice “circumcision.” If we’re going to teach and practice “tithing,” the none of us had better go to a store or restaurant on the “Sabbath,” because in so doing we’re sinning and we’re causing others who wait on us to sin because they have to work on that day. If we’re going to teach and practice “tithing,” then none of us had better eat any pork product again either. If I’m being legalistic in telling someone that they must not eat pork, then I’m also being legalistic if I tell someone that they must tithe. If we still insist on “tithing,” then how are we to do so? Is tithing the putting of $100 of every $1000 I earn into an offering plate on Sunday morning? Certainly that’s what most institutional churches would have us to believe. No, that’s not it. If we’re going to practice the Old Testament law of “tithing,” then it’s probably best we look at the Old Testament teaching first. One particular teaching on the subject of tithing that has caught my attention a time or two is Deuteronomy 14: 22 –29 which makes it clear that the tithe was to be “eaten.” The Israelites were to bring the tithe on a regular basis to the temple. If, however, they lived too far away, they could convert their tithe (grain, livestock, etc) to silver (money). When they got to Jerusalem, they could then again convert their tithe to “silver to buy whatever you like: cattle, sheep, wine or other fermented drink …and you shall EAT there in the presence of the Lord your God and rejoice” (Deut. 14: 26). Notice that the tithe was not cash put in an offering plate, but rather it was something that was EATEN while rejoicing in the presence of God. If we read further, the meal (tithe) was to be shared with the Levites. It’s an amazing parallel between the Old Testament tithe and our New Testament Lord’s Supper (the full meal, not the wafer and thimble of juice it’s become). The tithe was EATEN and it was SHARED with LOVE and with REJOICING and in the PRESENCE of God. 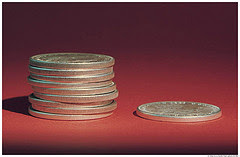 If, when we speak of tithing today, we were talking about that kind of tithing, I would have less of an issue with it. In reality, it’s probably not too unlike our modern potluck dinners. Unfortunately that’s not what is meant when we hear of tithing from the pulpits. When we hear of tithing from the pulpit, it is usually some other strange (and maybe even anti-Christ) thing that is being talked about. To that topic I now turn. Pastors who teach tithing will have you to believe that when you tithe, you’re giving your money to God. As a former pastor myself, I can attest to the fact that I used to preach that sort of thing. God forgive me. Those same pastors would have you to believe that putting ten percent of your income into the institutional church’s coffers is the same as God’s call of Malachi 3:10 to “bring the whole tithe into the storehouse.” Nothing could be further from the truth. The "storehouse" of Malachi is NOT to be understood as being the same as a modern institutional church offering plate. The New Testament makes it very clear that if we want to give to God, the way to do that is through giving, caring, and loving His people. There are many, many Scriptures to support that. I don’t believe that God is primarily interested in my money; He is interested in my heart as I relate to other people. He is interested in what I do about the hungry, the strangers, the naked (or homeless), the sick and imprisoned (see Matthew 25: 34-46). Here’s a thought: If I have “money” that I want to give to God, I think God would have me to lovingly and cheerfully use that money, not under compulsion, to help care for those kinds of people whose paths cross mine. Institutional churches will have us to believe that with the money we give, they do care for people like that. Unfortunately, they have far too high overhead costs that they look after first out of that money. The mortgage on the church building has to be paid first. The utilities and office supplies have to be paid first. All the fancy electronic equipment and instruments have to be paid for first. The pastor(s) and other staff have to be paid for first. What’s left? Not much. Modern institutional churches depend on their version of tithing, and they will continue to teach that man-made version. Their very survival depends on it. Without that regular influx of money into their coffers, they will cease to exist in the same manner as any other business, without a regular cash flow, will also cease to exist. An institutional church is more alike a man-made business than many may realize in that they both require cash to survive. Did New Testament Christians give money? Certainly they did, but not to an institutional system. They shared everything and there were no needy people among them (Acts 4: 32-37). They gave to meet the needs of the poor in Jerusalem (1 Corinthians 16: 1-4). They gave as much as they were able (and more) and out of overflowing joy (2 Corinthians 8: 1-7). The widow’s mite comes to mind (Mark 12: 41-44). Did that woman give a “tithe” (or only 10%)? No she gave everything she had (100%). The point is, do we think that the Lord is content with only 10 percent of us? Shouldn’t we rather focus on how to give God our “all,” as in 100 percent? So much more could be said about “tithing.” So much more has been said about “tithing.” The thoughts above are only my humble musings. Though I’ve grown to dislike the institutional church system, as God enables me, I continue to strive to love the people within that system. I guess like everyone else, this is a life-long journey and I doubt we will fully get there this side of Glory.